New clock in front of the Jewelers Exchange building on Washington Street. New and beautiful, especially in black and white. I wonder if anyone is ever asked for the time in this area. You never know....some folks can be a bit obtuse. 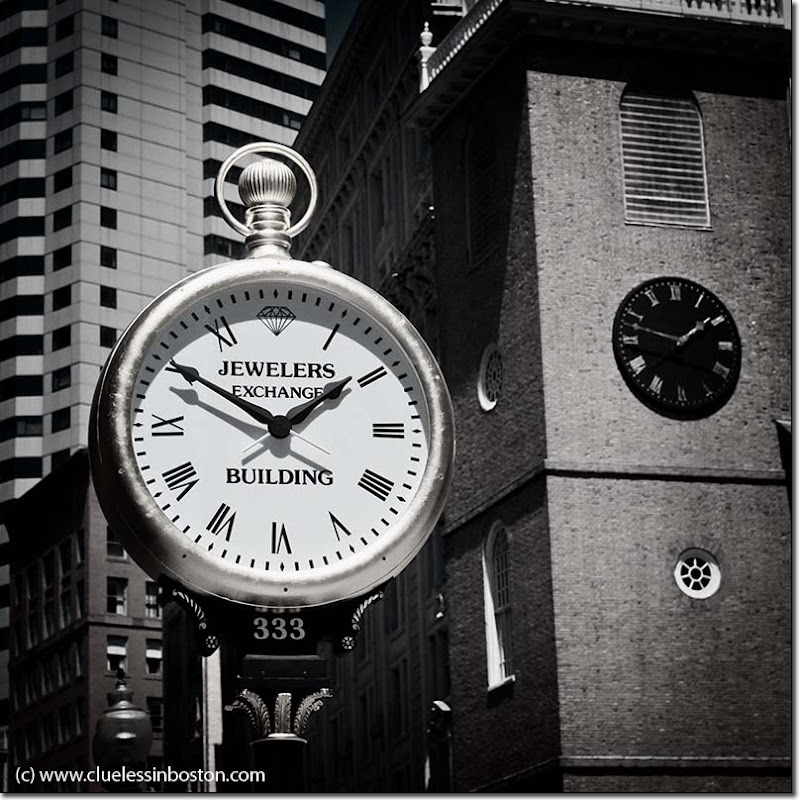 I like this in b & w.
Reminds me of the clock in Carson, Pirie, Scott in Chicago which was the most obvious place to meet when seeing friends. Miss it. The repetition of the circle/arch in this is just wonderful. I love clocks and these ones are superb! Love this photo. I like the way you did it in black and white. Very nice! So big that it seems unrealistic!A new version for Harold lloyd?.. Old South Meeting House in the background is a great touch. The new and the old. Very clever! Great capture of the free-standing clock and it is superb in black/white. Very reminiscent of a by-gone era. I like big clocks like this in the urban environment. Some new-old clocks like this have been installed here in recent years, but they don't always keep good time. That's one fine looking clock, great in black and white.